An essay entitled “Human Rights Abuses Committed by the Guggenheim and Louvre Museums on Saadiyat Island” written by graduate student Kara Hendrickson has been published in the first edition of the Fwd: Museums journal. 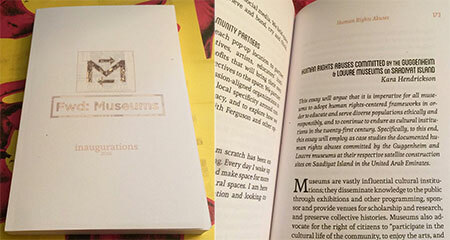 The journal is produced by the the Museum and Exhibition Studies (MUSE) Graduate Program at the University of Illinois-Chicago and is published through StepSister Press, LLC. The theme of this edition was to address the need to reimagine and critically transform museums and the cultural work within their spaces. Hendrickson’s essay was originally written as a capstone for the Department of Art History internship program. Welcome New Fall 2016 Graduate Students!